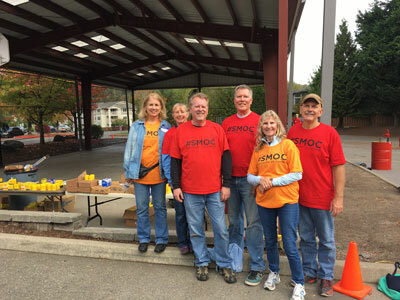 New Life Church of Renton, WA on the Maple Valley Highway hosts a Single Mom oil change event twice a year where volunteers from the church set up a “Big Shop” in the church parking lot and service the cars of single moms in the local area. Many of the cars’ only servicing is done at these events so it is a very helpful thing for these busy moms. Back in June 2015 the church donated a newer replacement car to one of the moms. She was overjoyed and brought to tears along with many of the volunteers. Around 200 cars are serviced at each event including oil changes, wiper blade replacement, vacuum service, fluid refills, light bulb replacement, tire pressure adjustment and sometimes tire replacements. The photo includes our Small Group from left Laurie Adams, Jimmi Serfling, Marshall Adams, Dave Serfling, Marcella Lawhon and Ron Lawhon. Missing from photo is Laura VanTrojen. This was a lot of fun. We got cleaned up for the photo. I guess we should have left some of the grease and oil on our hands and faces. It was a lot of fun, spending time with the people in our Life Group AND being a part of blessing the Single Moms in our community! Looking forward to the next Single Mom’s Oil Change (S.M.O.C. ), in the spring!